Today is full of phone announcements! AT&T just announced that it's going to offer the budget-friendly Pantech Flex Android smartphone beginning on Sept. 16 for $49.99 with a new two-year contract. The device features a 4.3-inch Super AMOLED display with a qHD resolution, an 8-megapixel camera capable of recording 1080p video, a 2-megapixel front-facing camera for video chat and a 1.5GHz dual-core processor. Pantech offers two modes on the Flex, an "Easy Experience" for first-time Android users that provides an "easy-to-read" application format and an intuitive user experience, as well as a standard Android option for those who are already adjusted to Google's mobile operating system. The Flex runs Android 4.0 Ice Cream Sandwich, although AT&T didn't say if Android 4.1 Jelly Bean will ever be made available. The first smartphone at AT&T to offer customers the option to choose between the traditional Android operating mode and a more simplified version ideal for new smartphone users, the Pantech Flex will be available exclusively from AT&T* online and in company-owned retail stores for $49.99 with a two-year agreement and qualifying voice and data plans, beginning Sept. 16. 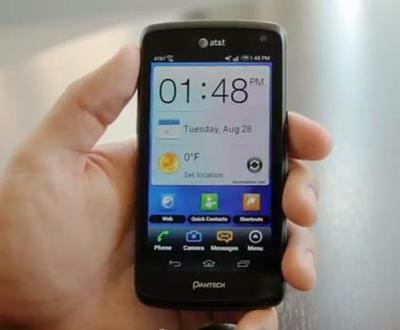 The Pantech Flex offers a unique dual experience system that runs on Android 4.0 (Ice Cream Sandwich). The standard Android format is available for the customer who wants instant access to a wide range of their favorite features – social media sites, email, video and more. In addition, Flex provides the "Easy Experience" mode which prioritizes customers' apps on the home screen in a clearly organized and easy-to-read format. Easy Experience users can enjoy an intuitive experience without sacrificing any of the latest in smartphone technology. By switching simply between traditional and easy modes, depending on preferences, Flex is a very easy to use device. To see more of the Flex's features in action, check out this video. In addition to its dual operating systems, Flex weighs only 4.6 ounces and has a slim design that makes it easy to slip into a pocket or purse. Flex features a full touch 4.3-inch qHD Super AMOLED display for a vibrant picture and a 1.5 GHz dual-core processor. The intelligent Pantech SwiftKey technology makes typing a breeze – it minimizes key strokes by learning a user's natural language for more accurate word predictions and corrections. Flex also features an eight-megapixel rear facing camera with 1080p HD video recording capabilities and a two-megapixel front facing camera. "The Pantech Flex is a great phone because of its versatility," said Jeff Bradley, senior vice president, Devices and Developer Services, AT&T Mobility. "This phone simplifies the smartphone experience and allows someone who has been hesitant to buy a smartphone a chance to get familiar with it at their own pace, and still leaves open the possibility of having the more traditional experience." "Flex is a smartphone that's truly for everybody," remarked Wyatt Whaley, vice president of product planning at Pantech. "With the option to alternate between the traditional Android interface and Pantech's proprietary Easy Experience, Flex is ideal for users of all ages looking for an intuitive and flexible mobile experience." Additional information about Flex can be found at, www.pantechusa.com.